Located at southern tip of Haeundae Beach, Dongbaek Island is one of the places to visit in Busan. Previously, it was an island. But with the accumulation of sediments, the island is now connected with the mainland by a landbridge. The long walking path around the island let you navigate the island. History says that the island honors Scholar Choi Chi-won. While walking, around the island, you will come across a bronze statue of the scholar and a monument in his memory. 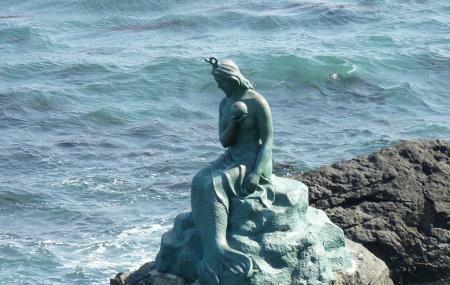 You will also pass by other attractions like the mermaid statue (representing the heart breaking love story of princess Topaz, the Nurimaru APEC House and the Carved stone. Also, visit the popular attractions in the city by following Busan itinerary 1 day. Parking facility and restrooms available. Spring is the best time to visit this island. For Nurimaru APEC House – 10:00 am to 5:00 pm. How popular is Dongbaek Island? People normally club together Haeundae Beach and Sea Life Busan Aquarium while planning their visit to Dongbaek Island.